Yes, we accept guest posts! 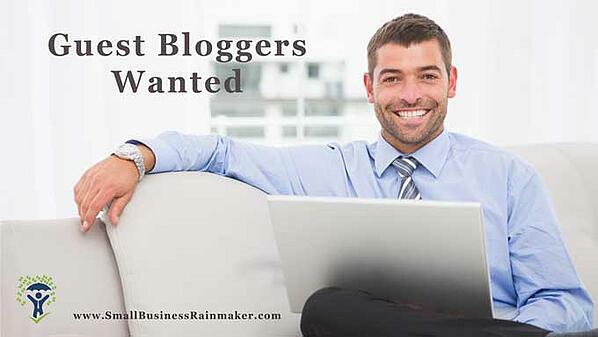 We're looking for articles from small business owners or managers like yourself, to publish on our fast-growing Small Business Rainmaker marketing blog. In return you get a short bio with a valuable back link to your website. You also get extra exposure through regular sharing of your post on our social media channels. We prefer articles that stem from your personal experience as a business owner or manager which are helpful in nature. Prefer first-person point of view. But if you're a freelance writer, we'll look at your work too. In this case, we like articles that establish authority in the small business marketing or operations niche. Include reputable statistics and sources to back up your points. If you think it could help other small business owners, we want to hear about it! Article length: Minimum 700 words, no maximum. We'll help with editing as needed. We'll supply images. Original articles only. No duplicate content that's already been published elsewhere. Must be good, high-quality English that doesn't require a lot of editing. We reserve the right to edit as needed. Articles accepted for publication become the property of the Small Business Rainmaker and can't be published elsewhere without permission. If we use your article, we’ll need a 25-50 word bio, a head shot if you have one, and a link to one of your websites or social media pages. Bio will be part of the article, at the end. You get one do-follow back link in your bio and one in the body of the article. The article back link must NOT be promotional in nature and should support the topic. In other words, no back links to home pages, landing pages, or sales pages. Links to blog posts, case studies, surveys, and white papers that support the topic are permitted. Your bio back link can be to any page on your site, subject to our approval. Backlink URLs - The back link URL used in the article must have readily accessible contact information, including your business name, physical address, and phone number. We only want to deal with real, reputable companies. Enter your details below. We'll reply via email with additional details or questions. <------ Read the guidelines on the left before you ask a question. You'll find answers to most questions there.